If you are on the look-out for an easy-to-use, affordable, and comfortable stroller for your kids, then you may want to check out the Baby Trend Sit N Stand Double Stroller. 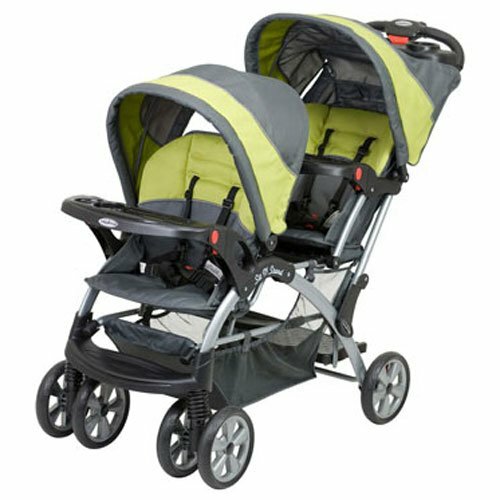 This double stroller is fairly lightweight, can be folded in one step, and can accommodate two infant car seats. More importantly, unlike other sit and stand strollers, the Baby Trend Sit N Stand gives you the option of turning your older child’s jump seat or stand in area, into a usual stroller seat for when the your older child needs to take a rest from being in the jump seat. 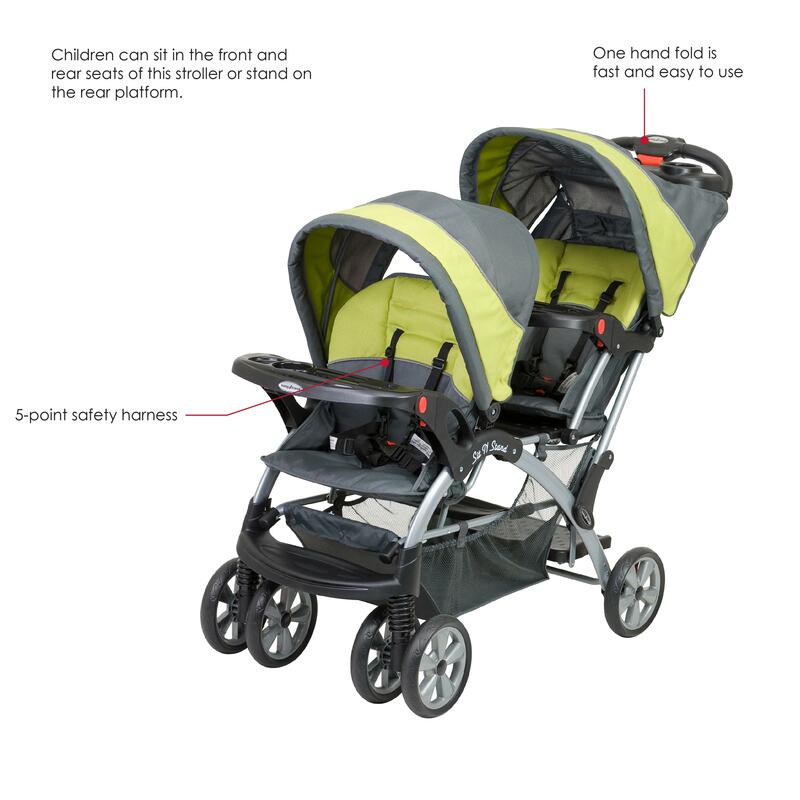 This stroller is also loaded with safety features such as five-point harnesses, as well as foot-activate d brake pedals. You will not have much trouble maneuvering this sit and stand stroller as it is light enough, easy to push, and stable even for sharp turns. So whether you are strolling in the park, or you are running errands in an indoor establishment, you will never have to get stressed over lugging around two kids. Your older child will definitely like the idea of being able to choose how she or he would like to ride the stroller. If he chooses to use the jump seat, or stand up during the stroll, he can. 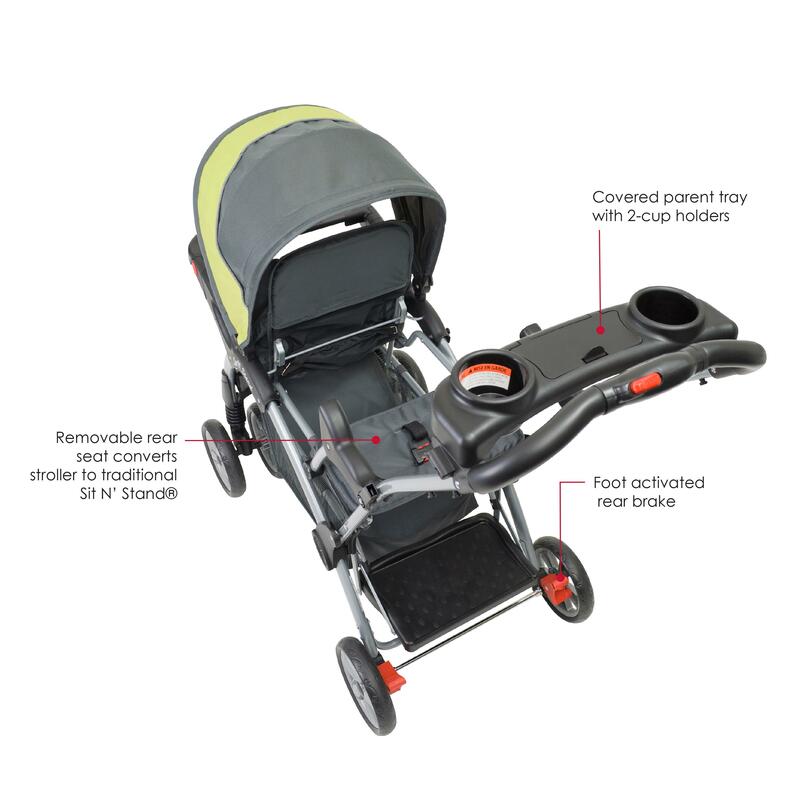 If in case he gets tired from a long day outing, then the stroller seat can be reinstalled to allow your older child to lean back and take a nap. Can accommodate two infant car seats. 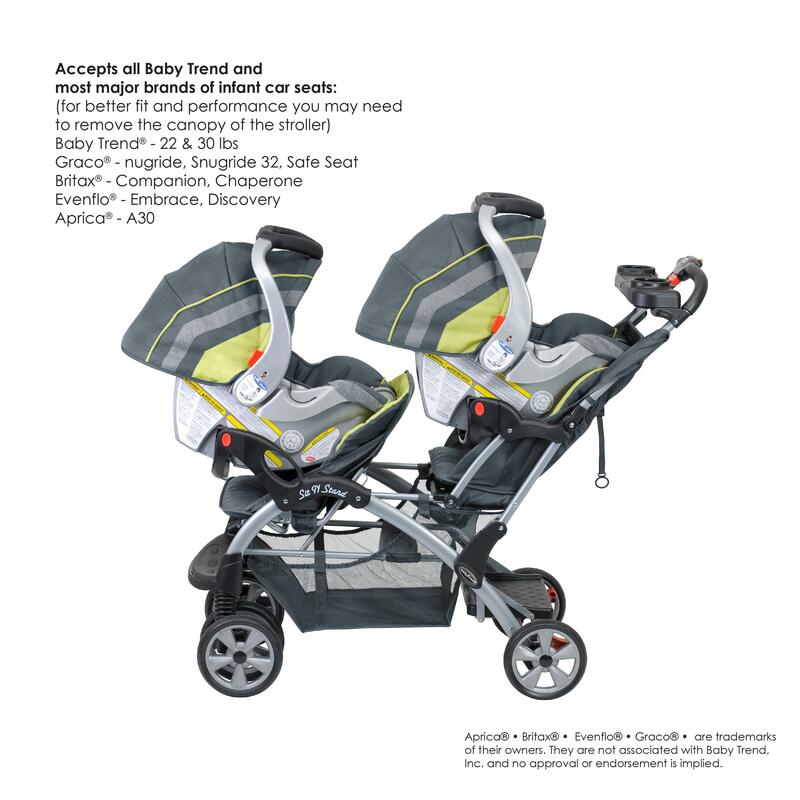 If in case you have twins, this double stroller can still work for you as it can accommodate two infant car seats. The folding snack trays paves the way for the infant car seats. 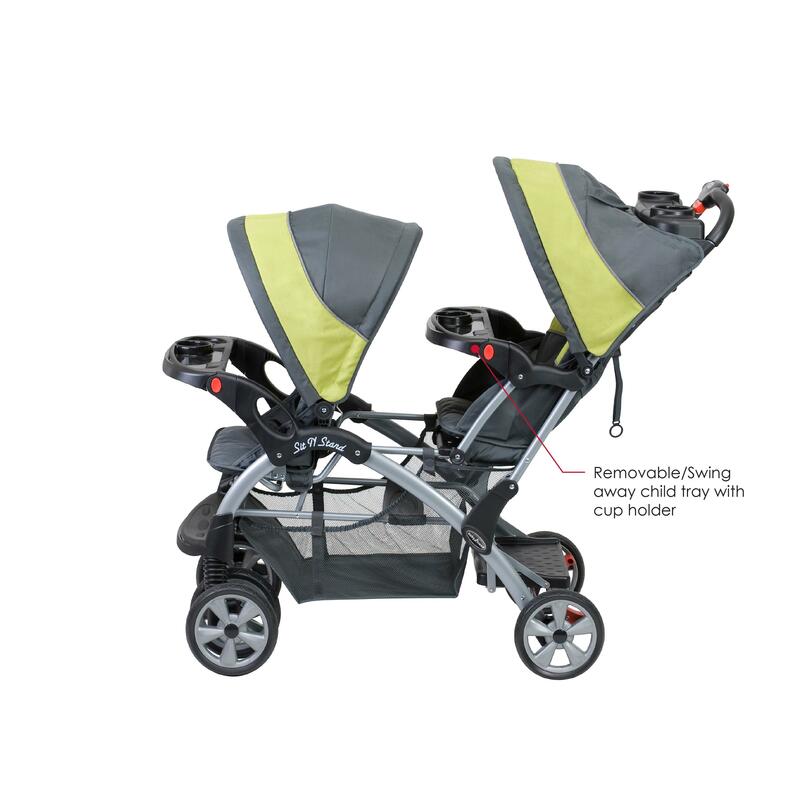 It is fairly lightweight compared to similar sit and stand double strollers in the market. It can fold with one-step using just one hand, and the thing is, it can stand on its own while folded. Its storage basket underneath can also accommodate a diaper bag for the outing, and a few more needs. There are available cup holders – one for each child, and two for the parents. There is a covered console as well near the stroller handle bar, where the parent or the caregiver can store mobile phones and keys safely. Unlike other sit and stand strollers, this Baby Trend stroller provides for a canopy even for the older child. This means that the child does not have to bear the striking heat or rays of the sun, or sudden downpour while strolling at the middle of the park. The parents can also choose to totally remove the canopy, should they prefer to do without it. The child food and drink tray can come off, meaning crumbs and drops of milk, juice or water can easily be cleaned off the trays – and can even be washed! The fabric used in the stroller is also very easy to spot clean and sanitize, as well as the other portions of the stroller. The Baby Trend Sit N Stand stroller has enough safety features that will put your mind at ease while using it. The five point harnesses for each child are all padded for extra comfort and convenience. There is a foot-activated rear brake system, and the stroller is made of durable materials that makes it a stable gear for your children to use. Lightweight: Compared to other Sit N Stand strollers, this Baby Trend model is relatively easier to carry, load up in the trunk, or store in your home. It can be folded using just one hand too! Great Maneuverability: Say goodbye to double strollers that limit your movement because this particular stroller is compact enough to fit doors in almost all commercial establishments. It is very easy to push around as well, and does not feel like you are bringing around a very long trail. Cleaning is a Breeze: You can dump all the cracker crumbs from the tray simply because it can come off from the stroller. You can even wash it. Spot cleaning is super easy to do as well! More choices for the Older Child: Older children tend to get bored quickly, but when they have a lot of seating options, you would not find it hard to entertain them during your stroll or errand. For instance, the older child can sit comfortably up front, or choose to seat on the elevated back seat stroller, or – as the name of this stroller model describes – Sit N Stand at the Jump Seat. Can accommodate heavier children: If one of your children or even both are on the heavy side, it would be great to note that this model can accommodate children up to 50 pounds each. The usual double strollers in the market have an average capacity of 40-45 pound weight limit for each seat. Storage Basket Accessibility: Some parents complain that when the jump seat is being utilized, it gets in the way of getting your stuff in and out of the storage basket underneath the stroller seats. 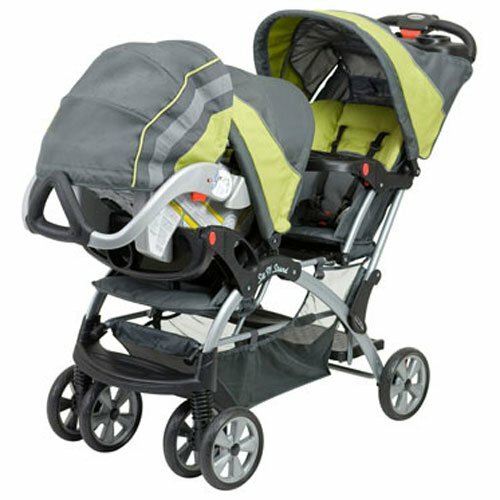 Still Bulky: It may be lightweight but like any double strollers, it is hardly compact or flat-laying. Expect that it will occupy a chunk of your vehicle’s trunk as well as your storage space at home. Manufactured outside the United States: If you are in search for a stroller that is assembled and manufactured within the United States, then you may find it a disadvantage that this stroller is made outside the country. It is not for bumpy roads, and uneven pavements: Since the stroller takes pride on its being lightweight, there happens to be a trade-off. Its smaller wheels would mean, it would be harder to negotiate rough roads, and unpaved areas. The Baby Trend Sit N Stand Double Stroller is a practical choice for growing families who would like to prioritize seating comfort, affordability, as well as ease of use in choosing a double stroller for their children. This stroller can accommodate car seats (even those made by other brands) and that the stroller gives your older child more riding options that may take boredom away when tours or strolls take longer than expected. The stroller is very safe to use, convenient as it comes with a one-step, one-hand folding system, and can stand on its own once folded. As for the price point, it is at the mid-range level, and can compete considerably well with similarly-priced strollers in the market. It is a practical choice, and is durable enough to last, and even go beyond your kids’ stroller riding years. Have a look at our complete guide about buying the best double stroller reviews here.